It has become a tradition in the past five years or so, that I would book a weekend away somewhere for the Mother and I as her Christmas present. 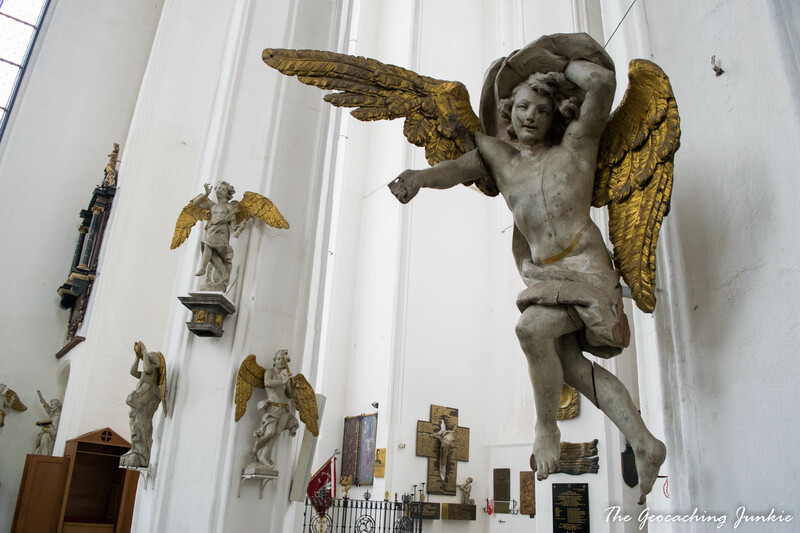 The first two years we went to Rome – we loved it so much the first time, we had to go again the next year – and in subsequent years we have visited Belgium (finding caches in five countries in a single day) and Yorkshire. So, where to go in 2017? 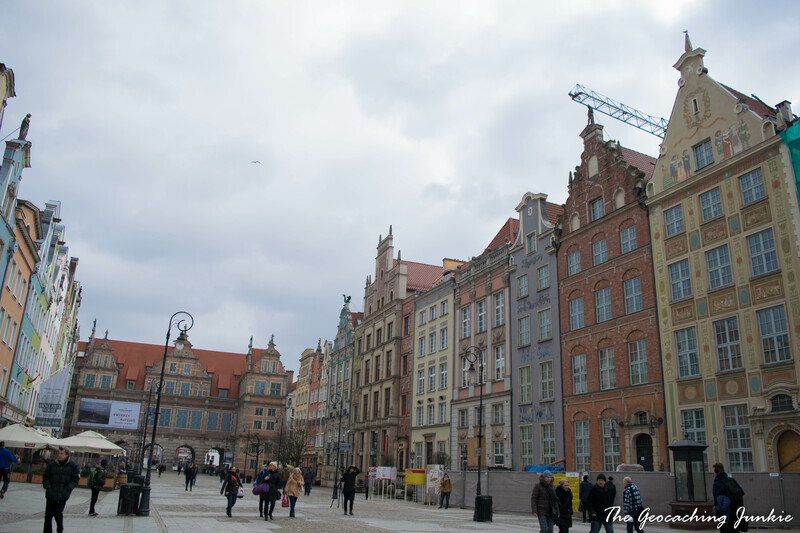 Poland has been on my to-do list for quite a while, so a combination of cheap flights and plenty of geocaches to keep us busy meant that I soon had flights booked for Gdańsk. 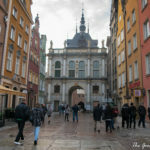 We arrived early on Friday morning and were pleased to find our hotel, Wolne Miasto, was a mere five minute walk to the heart of old town Gdańsk. We were kindly allowed to check in early, so after depositing our bags, we headed straight to Piwna. I was immediately struck by how beautiful the architecture was, and I have to admit, pleasantly surprised. 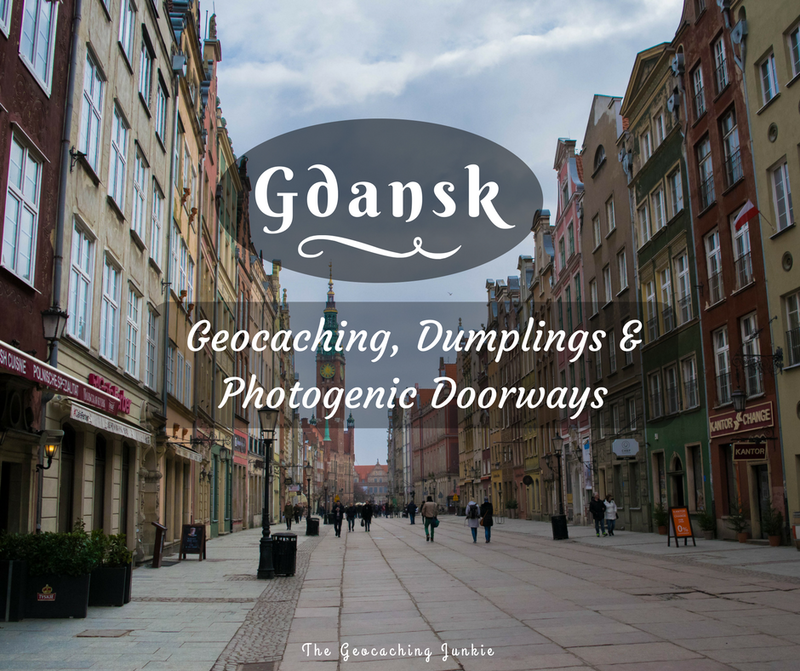 There is always an element of planning in my trips, especially when it comes to geocaching, but since I didn’t know all that much about Gdańsk, I decided to avoid looking at photos of the city in advance, so I could fully experience it ‘in the flesh’, so to speak. I also read a short summary of the city’s history on the flight over, which I highly recommend doing because it gives you a greater appreciation when you actually visit a place. 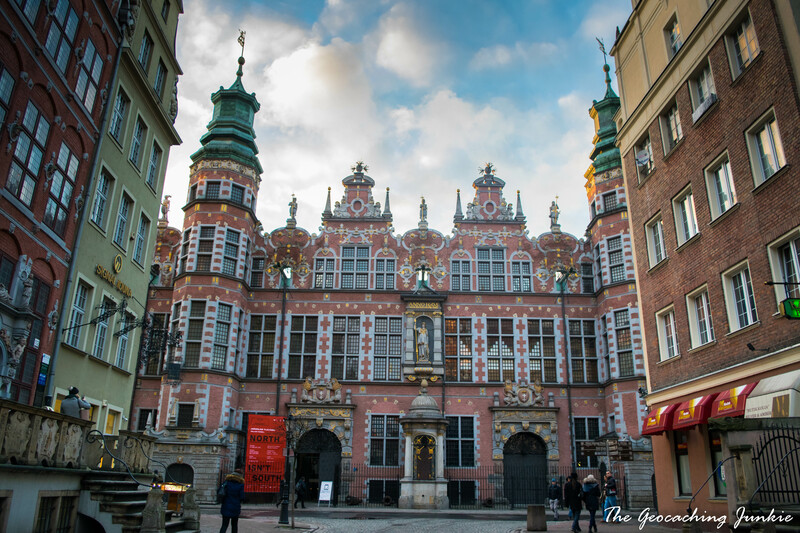 Gdańsk was once a thriving brewing city with an estimated four hundred breweries in existence in the sixteenth century. 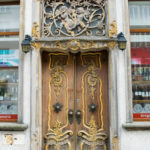 This history is reflected in many street names, like Browarna – Brewery Street, Słodowników – Malt Maker’s Street, and of course, Piwna, literally ‘Beer Street’. Though the brewing tradition had all but died out, it has recently been through something of a revival with several micro breweries popping up. 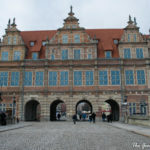 At one end of Piwna is the Great Armoury (Wielka Zbrojownia), an impressive Renaissance-style building originally built at the turn of the seventeenth century, but decimated during World War II and subsequently rebuilt in more recent years. 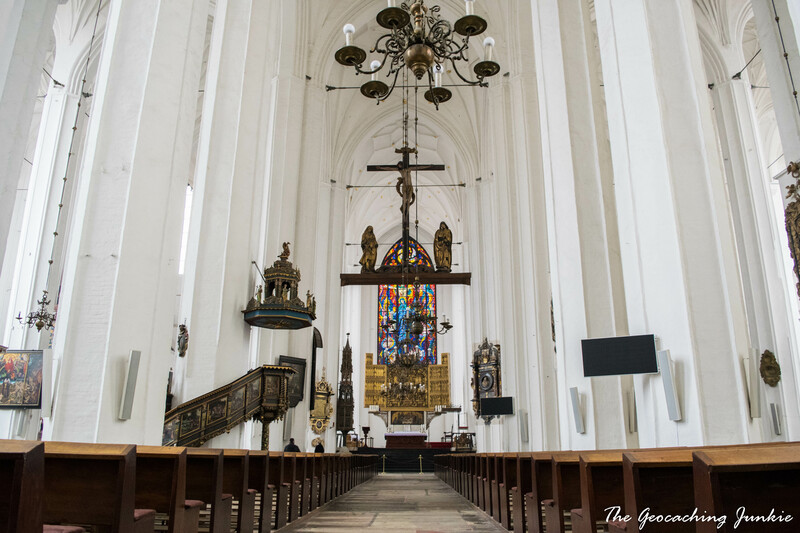 At the other end of Piwna is St. Mary’s Basilica (Bazylika Mariacka), one of the largest brick churches in the world. In my opinion, it’s the interior of the basilica that really makes it special. The walls are bright white and a magnificent stained glass window dons the space behind the altar. Hours could be spent drinking in all the intricate details all over the church. 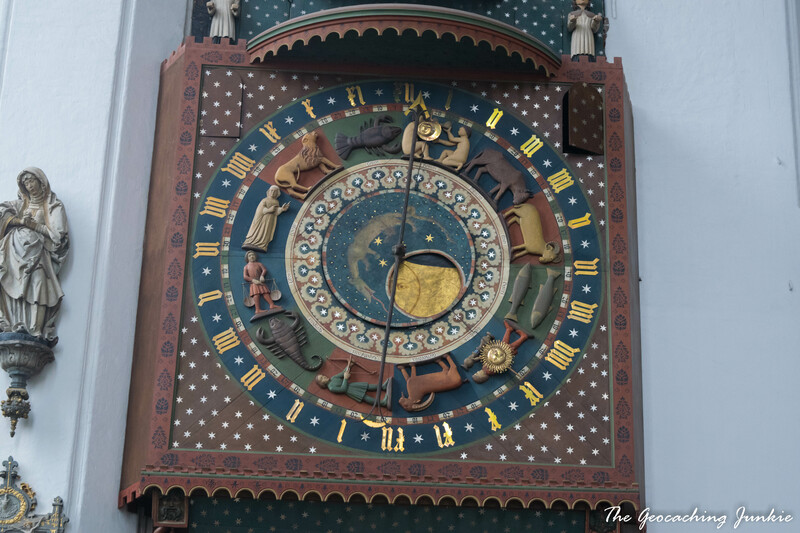 The most notable feature is the impressive astronomical clock, originally constructed in the fifteenth century by Hans Düringer and reconstructed after World War II due to extensive damage. 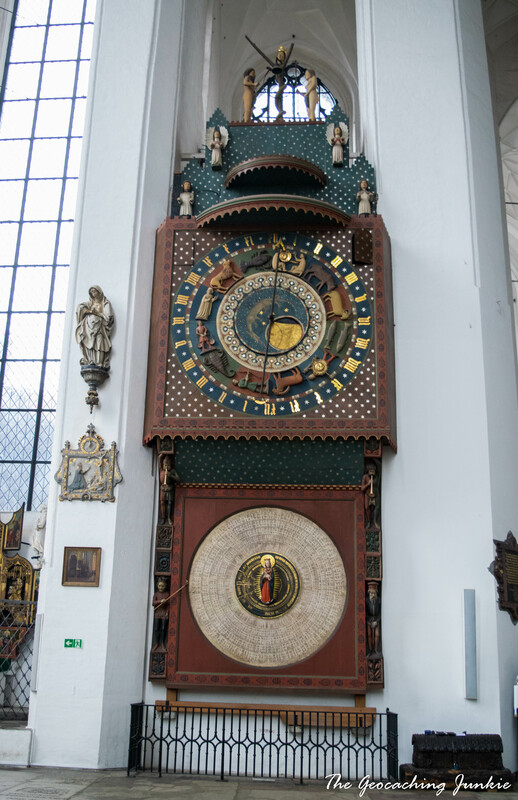 The clock stands at 14 metres high and legend has it that the authorities had Düringer blinded upon finishing the clock, to ensure that he could never build another as beautiful. 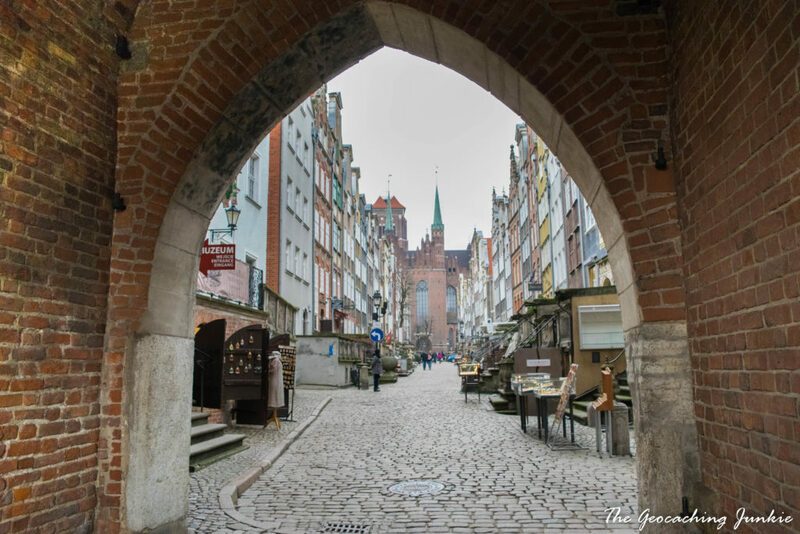 This picturesque street at the back of St Mary’s Basilica was essentially a pile of rubble following World War II, but has been faithfully restored to its original Gothic look. Most of the old town is still cobble-stoned; we even witnessed workers relaying cobbles on one street. 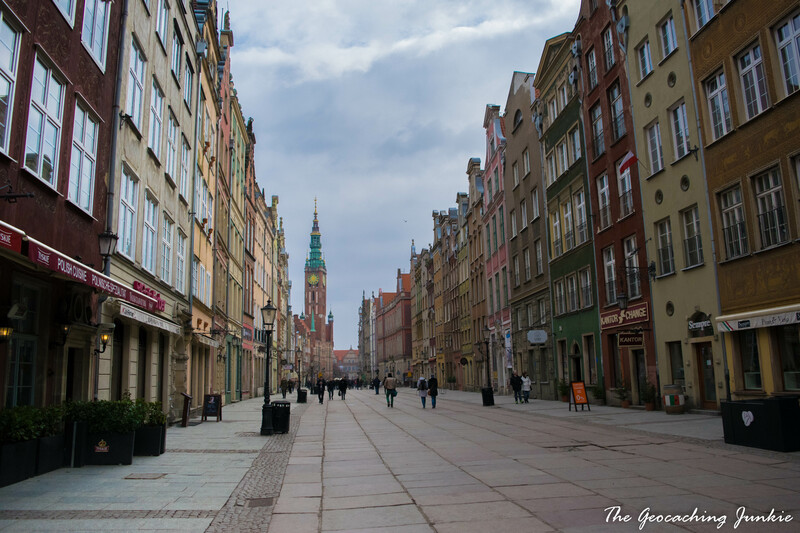 A huge amount of effort is clearly put in to retaining the old town as it was, which really adds to the experience when walking around. 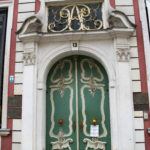 Mariacka Street has a high concentration of shops selling amber jewellery and trinkets. 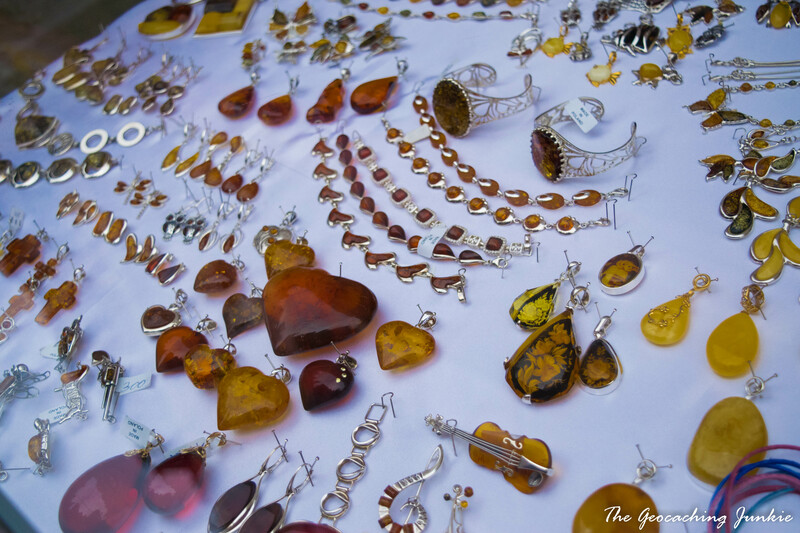 Often referred to as Baltic Gold, amber, which is fossilized tree resin, was formed at least 45 million years ago in coniferous forests in the region and Gdańsk is a renowned centre for purchasing amber adornments. 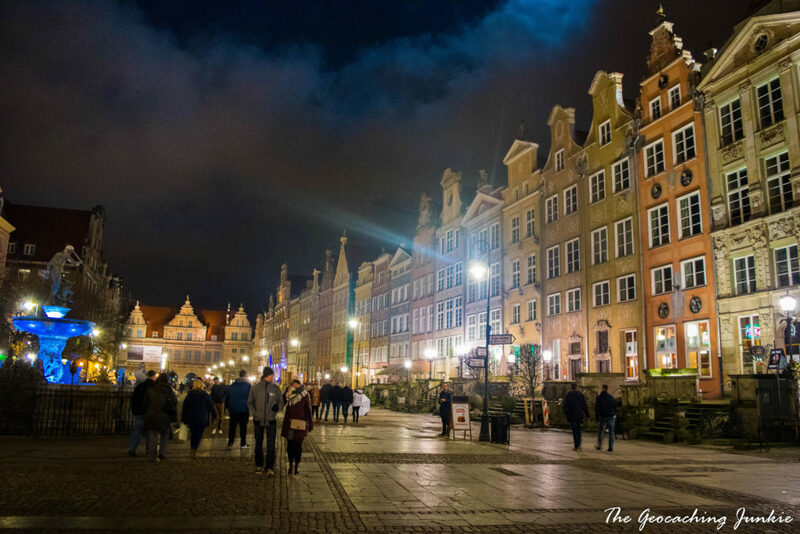 The most popular tourist street in Gdańsk, the Long Lane starts from the Golden Gate, continuing past Gdańsk Town Hall, Long Market (Długi Targ) and Neptune’s Fountain, ending up at Green Gate (Brama Zielona) near the river. 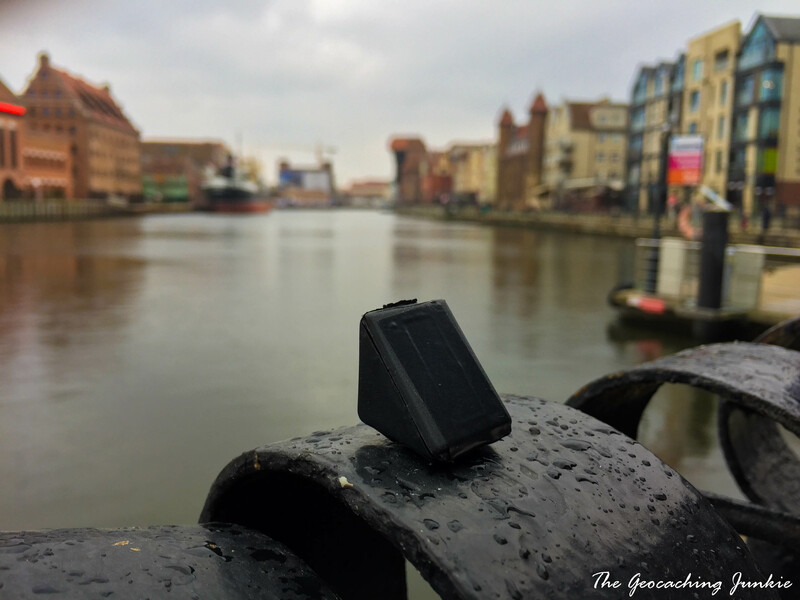 Before arriving on Long Lane, we stopped by the Gdansk TB Hotel, probably my favourite geocache of the trip. We walked past GZ at first and couldn’t see anything when I suddenly spotted the oh-so-obvious container sitting right out in the open. Ever so brazen, and a brilliant find as a result! The majority of the buildings on either side of Long Lane are fascinating works of art. 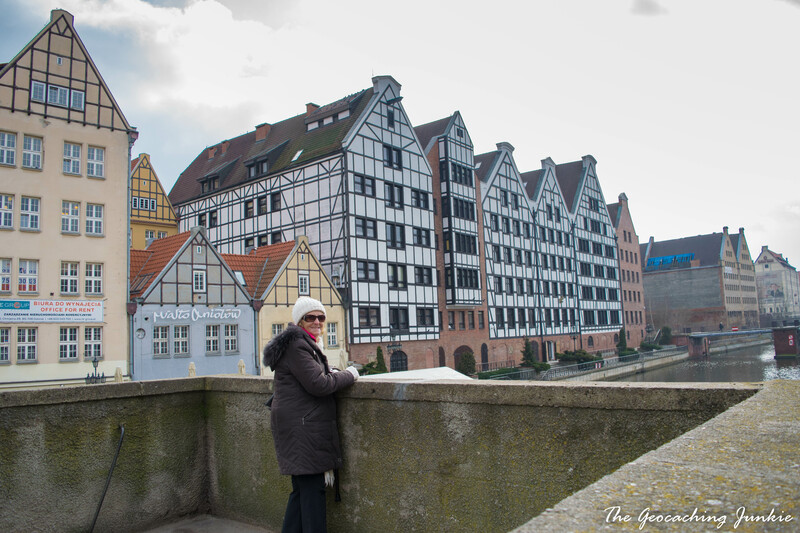 You could spend the entire ramble from one end to another looking at the doors and decorative elements all the way up to the rooftops, and basically screaming out ‘I’m a tourist!’ in the process. 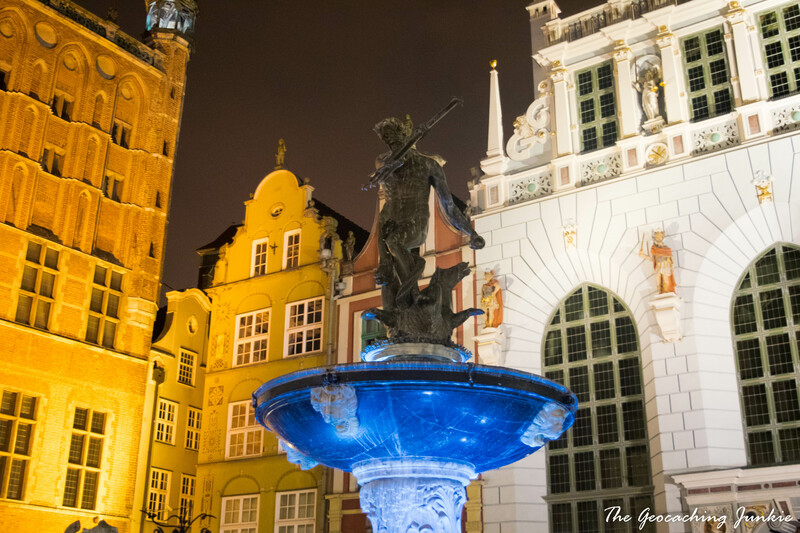 Neptune’s Fountain was originally constructed in the 17th century and was placed facing the townhouses on Long Market, which were home to the Polish Kings while in Gdansk. 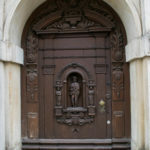 The fountain didn’t escape the ravages of World War II and had to be renovated, at which point Neptune’s modesty was protected with the addition of a fig leaf. 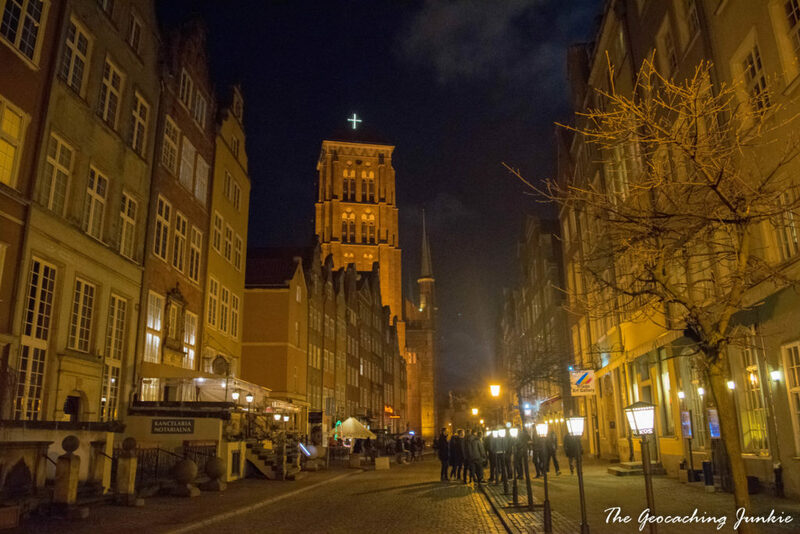 Gdańsk has been an important seaport since medieval times and was a member of the Hanseatic League in the 14th and 15th centuries. 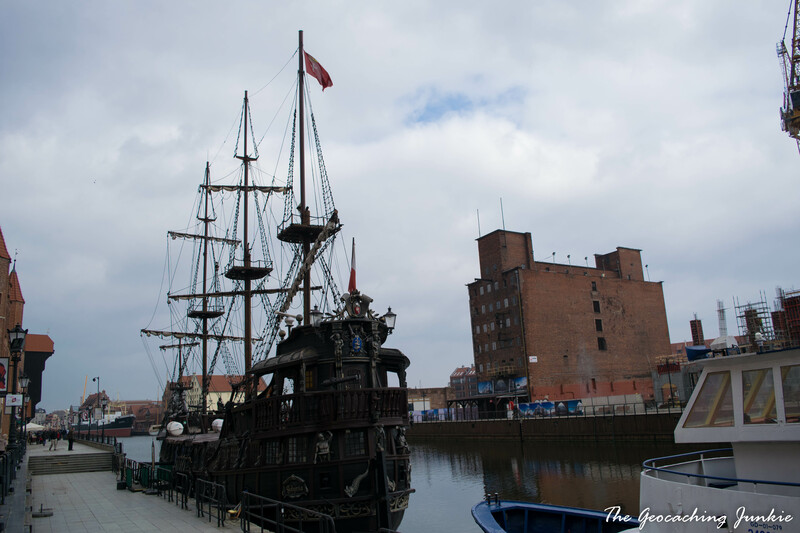 An imposing tall ship called Black Pearl is frequently docked on the river near Green Gate, when it’s not ferrying tourists between Gdańsk and Westerplatte. We didn’t have a chance to do the tour, but it’s definitely something I would like to do on a future visit. 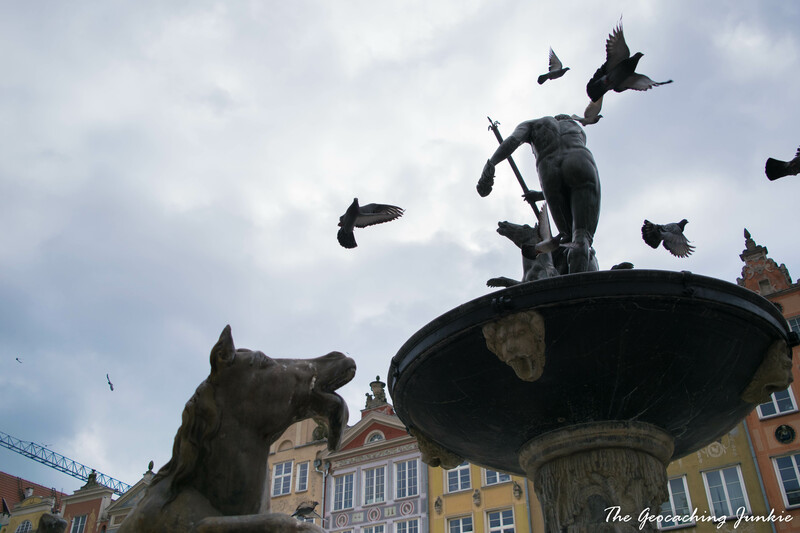 Despite the many beautiful buildings and monuments in Gdańsk, the unique medieval ‘crane’ has become synonymous with the port city. 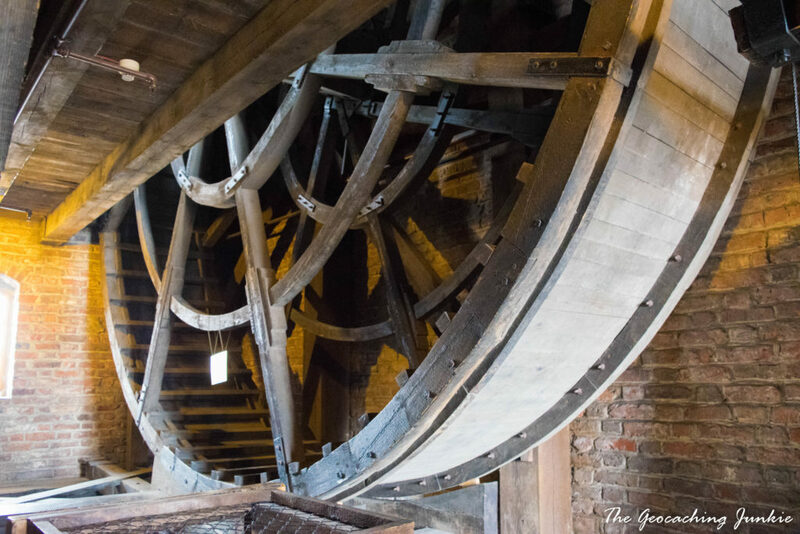 The current design was built in the 15th century and was used as a working crane to build masts and transfer cargo to ships up until the middle of the 19th century. 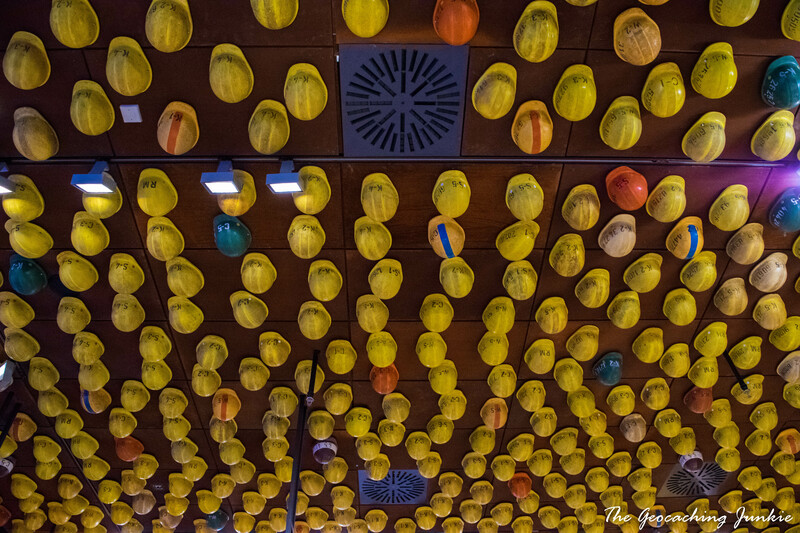 We paid to go inside the crane and it’s well worth the entrance fee of just 8 Zloty (around €2). There are various displays on each floor, showing how the rooms may have looked over the hundreds of years the building was a working crane. It’s quite a unique experience and well worth doing, with nice views out to the river and directly down to the street below; stay away from the windows if you have a fear of heights though! On a short weekend city break, I am not generally inclined to spend hours on end walking around museums unless it’s an extra special one. The European Solidarity Centre definitely fits the bill. 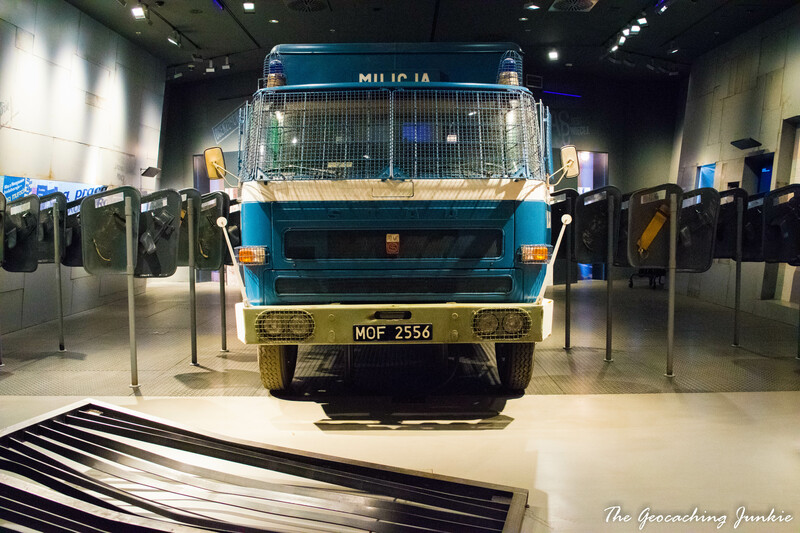 The centre’s permanent exhibition is based on the history of the Solidarity movement, a trade union founded in 1980 at the Lenin Shipyard. 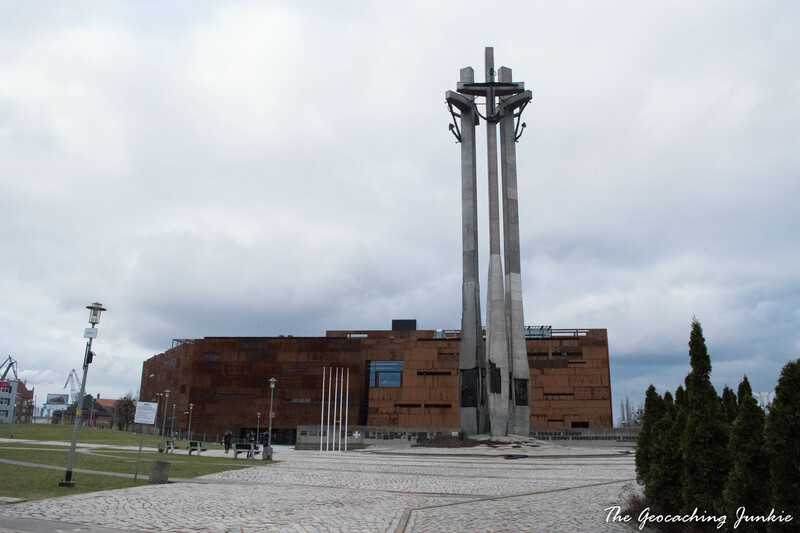 The immense Monument to the Fallen Shipyard Workers of 1970 looms over the museum building, in front of a wall inscribed with numerous memorials and plaques to victims of totalitarianism. The erection of this monument was one of the demands of Solidarity in 1980. 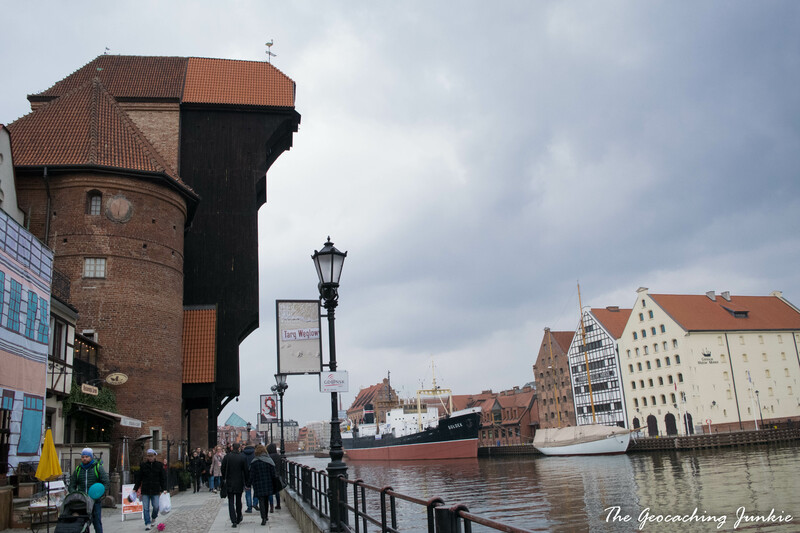 The centre stands just behind the historical gate #2 of the Gdańsk Shipyard (Stocznia Gdańskа), where, in 1980, Lech Walesa (co-founder of Solidarity and 2nd President of Poland) announced to gathered crowds that a deal had been struck with the Communist government on behalf of the workers. 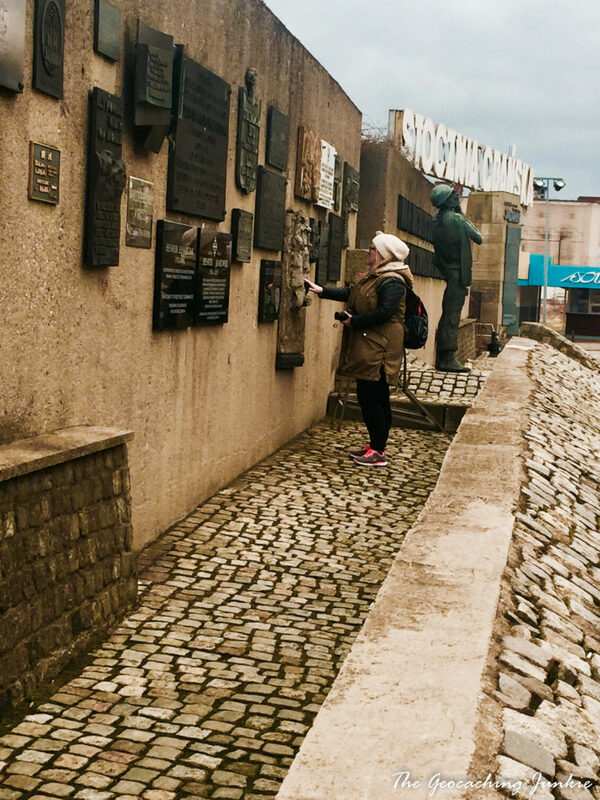 The story of Solidarity is both fascinating and emotive in equal parts, and the centre successfully memorialises the victory achieved through peaceful means, despite the many obstacles in the way. It may have started out as a labour union with almost 10 million members by the end of its first year, but Solidarity contributed in no small part to the collapse of Communism in Poland. 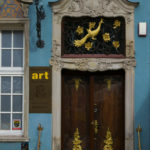 Gdańsk has endless surprising delights for the eyes, around almost every corner. 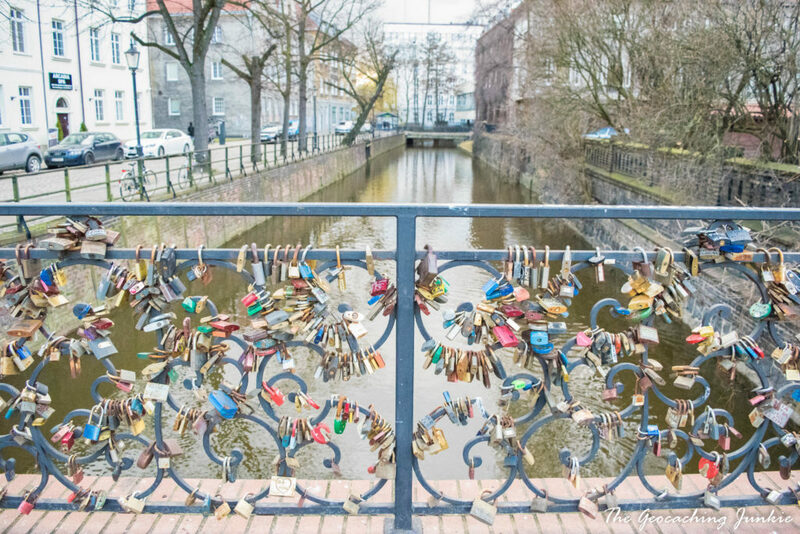 As with most cities these days it seems, there is also a bridge of love locks (Most Milosci, literally ‘bridge of love’). The bridge is actually called Most Chlebowy, and it has racked up an impressive number of locks. 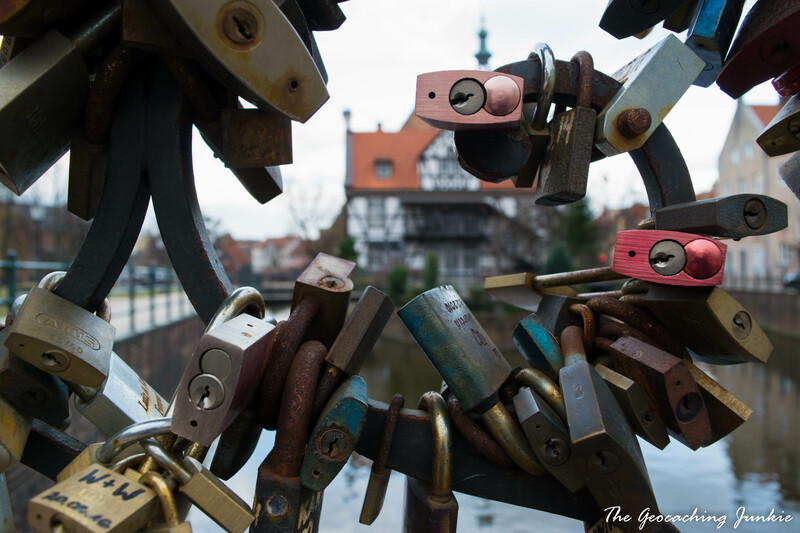 I don’t know what it is about love lock locations but I am always drawn to them: there is something beautiful about them, perhaps it’s all the ‘love’ in the air! 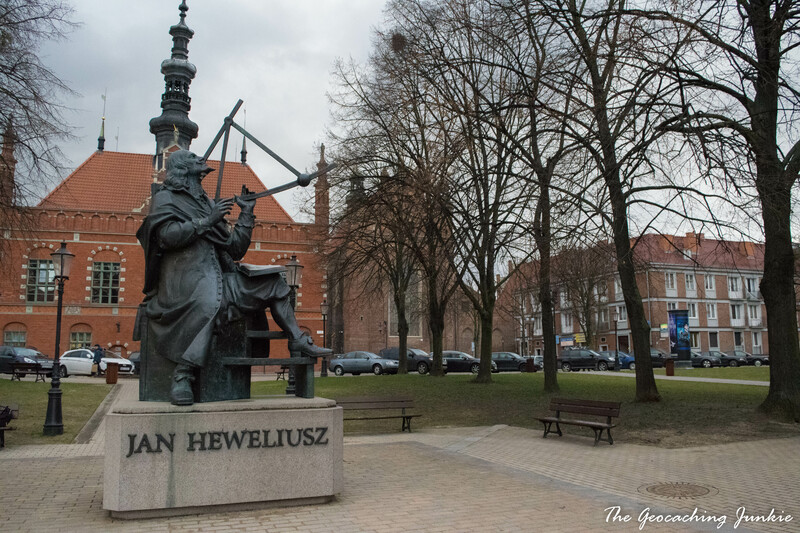 Near to the bridge of love is a statue of Jan Heweliusz, mayor of Danzig in the 17th century and a renowned astronomer, who found ten new constellations in his lifetime, of which seven are still recognised by astronomers. 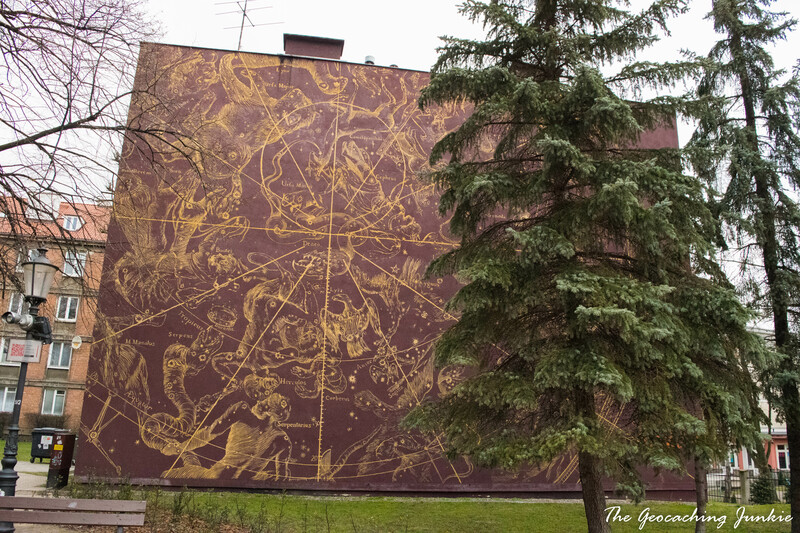 What’s really striking about this little park is the constellation wall, positioned in such a way that it appears Heweliusz is gazing at the stars. I always try to eat something regionally typical when I visit a new place and I was in the advantageous position of having a Polish friend to guide me on what to try. We were only there a short time so I didn’t get to try everything she suggested (unfortunately! 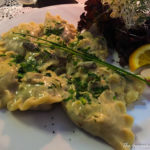 ), but I particularly enjoyed Pierogi, or meat dumplings, and ordered them for dinner both nights – the venison ones were best! 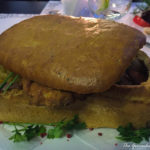 The mother ordered schabowy, a breaded pork chop reminiscent of schnitzel, which sounds simple enough but it was served, along with roast potatoes and fried cabbage, inside an entire bread loaf! For dessert, a slice of sernik, a baked cheesecake, is an absolute must-try and you can wash it down with a glass of Danziger Goldwasser, a strong liqueur produced in Gdańsk since the 16 century, which has real flakes of gold in it. 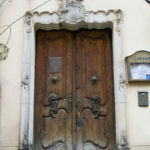 If there’s one thing more annoying than someone who keeps stopping to take photos, it must be when that someone is stopping to take photos of doors! 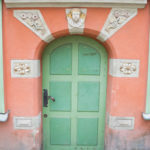 I became slightly obsessed with the numerous magnificent doorways we saw over the weekend and was definitely quite snap happy. 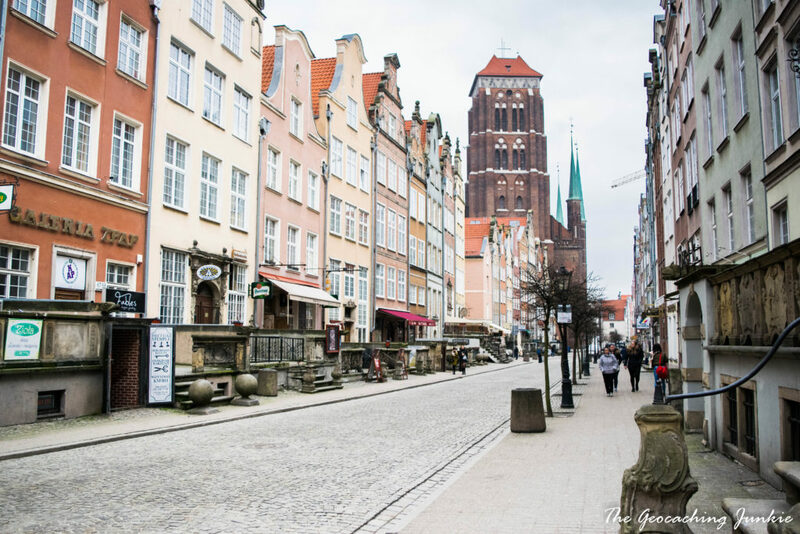 They will be one of the many things I remember about the beautiful city of Gdańsk – the attention given to the intricate details of the doorways both fascinated and delighted me. 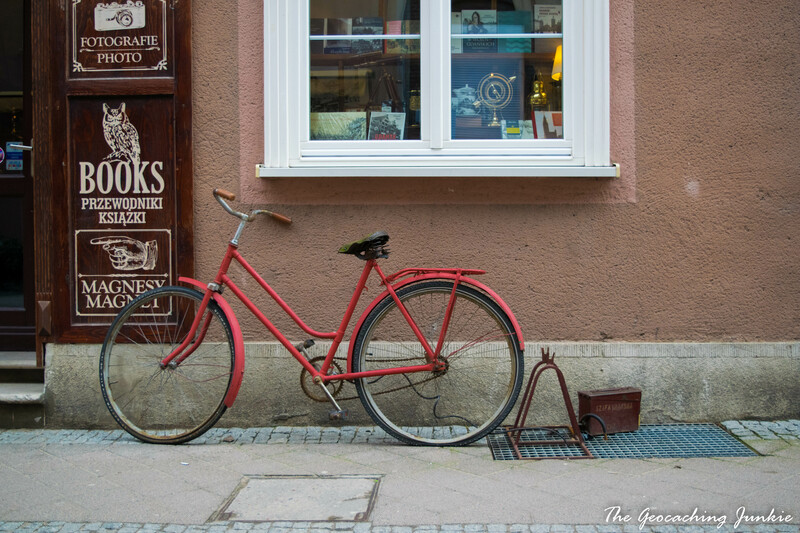 Awesome post about a place that is now on my ‘must visit’ list. Thank you for a fabulous tour of your weekend holiday. Thanks you for visiting us, come back- but for looonger! 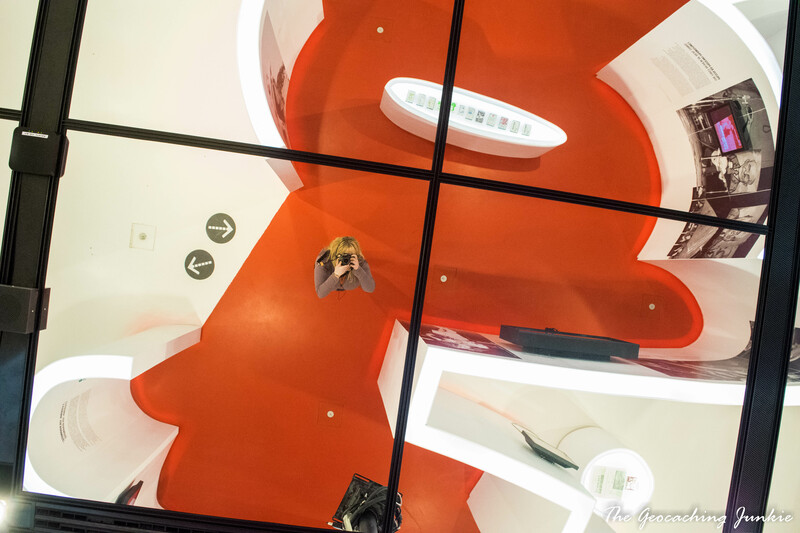 Great photos and post! My to-travel list is now one line longer..